Welcome to the Freeola Internet customer support pages. This guide is designed to help with setting up your Safecom Router to work with Freeola Broadband via a No-NAT connection. For more internet help topics please visit our main Support Page. If you are looking for general ADSL router conifguration please visit our General Router Settings help guide. For a standard NAT enabled Safecom setup guide please click here. You should be asked to log into your routers internal software with a username and password. The user name is Admin and the password by default should be Admin. The next page should be called Smart Setup, select Others from the ISP menu. Untick the options NAT and Firewall and click the Apply button. Now click on the LAN Configuration option on the menu, then Configure in the LAN Group 1 section. Select the option that reads Use the following Static IP address, as shown below. Enter the Router IP address you were supplied by the Freeola Support team into the IP Address field. Enter 255.255.255.248 into the Netmask field. The Default Gateway should not be changed, Host Name and Domain will not affect the performance of the connection. You should disable your DHCP server by selecting Server and Relay Off. Click on Apply to save these changes. You will be prompted that the IP address of the router is being changed, do not click on the link until you have completed the next step. You will now need to change the IP address of the computer that you are using so that it is able to see the router. In order to do this, go to the Windows Control Panel, and select Network Connections (Or Network and Sharing Centre on newer versions of Windows). Make sure that Use the following IP address is selected. Enter in the IP address you want to use, this would usually be the next IP address in the range you have been assigned. For example if you have been given 10.195.195.52 as the start of the range you can use any IP Address from 10.195.195.53 to 10.195.195.56. Enter in the Subnet Mask, this should be 255.255.255.248. Enter in the Default gateway, this would be the same IP address as you entered on the router in section 10. 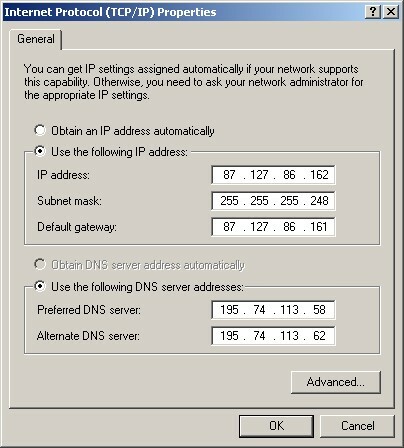 Make sure that Use the following DNS server address is selected. Enter 195.74.113.58 in the Preferred DNS server. Enter 195.74.113.62 in the Alternate DNS server. Click on OK and then OK on the properties dialog to close these windows and save the changes. You can now click on the link on the Web browser from section 14. The Web browser should then load with the Safecom Router configuration pages. Your router should now be connected to the internet. Go to Tools on the top menu, click System Commands and then click Save All. To finish click Log Out on the left. You will need to repeat steps 15 to 26 for any other machines you want to give a IP address to (using a unique IP address from the range given to you).